The technology of the liquid-argon time projection chamber, commonly abbreviated LArTPC, was first proposed by scientist Carlo Rubbia in 1977. It was conceived as a tool for detecting neutrinos in a way that would result in completely uniform imaging with high accuracy of massive volumes (several thousand tons). ICARUS T600, the first large-scale detector exploiting this detection technique, is the biggest LArTPC ever realized, with a cryostat containing 760 tons of liquid argon. Its construction was the culmination of many years of ICARUS collaboration R&D studies, with larger and larger laboratory and industrial prototypes, mostly developed thanks to the Italian INFN funding agency. Nowadays, it represents the state of the art of this technique, and it marks a major milestone in the practical realization of large-scale liquid-argon detectors. The ICARUS T600 detector was previously installed in the underground Italian INFN Gran Sasso National Laboratory and was the first large-mass LArTPC operating as a continuously sensitive general-purpose observatory. The European laboratory CERN, located 730 kilometers away in Switzerland, provided a beam of neutrinos that traveled undisturbed straight through Earth to the ICARUS detector at the Italian laboratory. This was known as the CERN Neutrinos to Gran Sasso beamline, or CNGS beamline. The operation of the ICARUS T600 detector demonstrated the enormous potential of the liquid-argon detection technique, addressing a wide physics program with the simultaneous exposure to the CNGS neutrino beam and cosmic rays. Δm2 as a function of sin2(2θ) for the main experiments sensitive to the νμ → νe anomalies and for the ICARUS T600 result (continuous red lines). The yellow star marks the best fit points of MiniBooNE. The ICARUS limits on the oscillation probability for νμ → νe are P (νμ → νe) ≤ 3.86 × 10−3 and P (νμ → νe) ≤ 7.76 ×10−3 at 90% and 99% CL. The ICARUS T600 detector concluded in 2013 a very successful three-year-long run at Gran Sasso National Laboratory, collecting 8.6×1019 protons on target with a detector live time exceeding 93 percent, recording 2,650 CNGS neutrinos, in agreement with expectations, and cosmic rays (with a total exposure of 0.73 kilotons per year). ICARUS T600 demonstrated the effectiveness of the so-called single-phase TPC technique for neutrino physics, providing a series of results, both from the technical and from the physical point of views. Beside the excellent detector performance as tracking device and as homogeneous calorimeter, ICARUS demonstrated a remarkable capability in electron-photon separation and particle identification, exploiting the measurement of dE/dx versus range, including also the reconstruction of the invariant mass of photon pairs to reject to unprecedented level the NC background to νe events. The tiny intrinsic νe component in the CNGS muon neutrino beam allowed ICARUS to perform a sensitive search for anomalous LSND like νμ → νe oscillations. Globally, seven electron-like events have been observed, consistent with the 8.5 ± 1.1 events expected from intrinsic beam νe component and standard oscillations providing the limit on the oscillation probability P(νμ → νe) ≤ 3.86 × 10−3 at 90% CL and P(νμ → νe) ≤ 7.76 × 10−3 at 99% CL. The following figures shows one of the seven electron-like events, where the unique detection properties of LArTPC technique to identify unambiguously individual electron events with high efficiency is evident: the evolution of the actual dE/dx from a single track to an e.m. shower for the electron shower is clearly apparent from individual wires. CNGS νe CC event: a high energy CC electron is evident, as well as a short, highly ionizating proton starting from the main vertex of the neutrino interaction. Evolution of the actual dE/dx from a single track to an electromagnetic shower is evident. Many global analyses of experimental results have been performed fitting to models, including one or more sterile neutrinos. 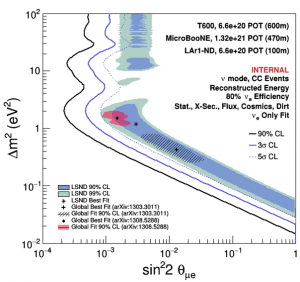 Even after 20 years, the LSND result is still the dominating one in terms of significance in all global sterile neutrino fits, but it has not been fully confirmed or rejected yet. An experimental configuration, the Fermilab Short Baseline Neutrino (SBN) program, to search for possible sterile neutrino states mediating short-baseline oscillations has been proposed to include three LArTPC detectors located on axis in the Booster Neutrino Beamline (BNB) at Fermilab. 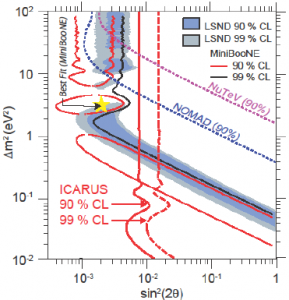 The SBN program aims at a definitive clarification of the LSND sterile neutrino puzzle. The near detector, called the Short-Baseline Near Detector, or SBND, with an active mass of 112 tons, will be located 110 meters from the BNB target. The MicroBooNE detector, which has been taking data with the BNB since 2015 with its 89-ton active mass, is located at 470 meters from the target. The far detector is the ICARUS T600, with 476 tons of active mass and located in a new building 600 meters from the BNB target. The detector locations were chosen to optimize sensitivity to neutrino oscillations and minimize the impact of flux systematic uncertainties. The assumed exposure is 6.6 × 1020 protons on target in SBND and ICARUS T600 and 13.2 × 1020 protons on target in MicroBooNE. The following figure presents the experimental sensitivity of the Fermilab SBN program to νμ → νe appearance signals in the (Δm2, sin2 2θ) plane with a comparison to the original LSND allowed region. The LSND 99 percent confidence level allowed region is covered at > 5σ level above Δm2 = 0.1 eV2 and > 4.5σ everywhere. Note that the region below Δm2 = 0.1 eV2 is already ruled out at more than 5σ by the previous results of ICARUS at Gran Sasso. Sensitivity of the SBN Program to νμ → νe oscillation signals. The ability to perform searches for oscillation signals in multiple channels is a major advantage for the Fermilab SBN oscillation physics program. By collecting the νμ and νe event samples in the same experiment at the same time, correlations between the samples can be well understood and many systematics are common. This implies that a simultaneous analysis of νe CC and νμ CC events will be a very powerful way to explore oscillations and untangle the effects of νμ → νe, νμ → νx and νe → νx , if they exist, in this mass-splitting range.